Arm yourself with enough wellness challenge ideas to last you through 2016! Health and wellness have seen a drastic increase in recognition over the past 15 years as many people are beginning to realize that their quality of life is just as important as their success in life. Thankfully, smart companies are realizing the added benefits of health amongst their employees and have begun to encourage healthy lifestyles in the workplace. You may be among those that are ready to lead your employees to a healthier, happier, more energetic life. But where do you start? It can seem daunting at first to know what health practices to encourage. Why not implement a different wellness challenge every month? Need some ideas? We have plenty to share! When handled correctly, this weight loss team challenge is a favorite among workplaces. Have employees weigh in discretely at the beginning of the month and track success each week. Give a small reward at the end of each week to encourage momentum. Send percentages lost (not actual weight in pounds) through email or social media groups so there is no face-to-face embarrassment and make sure that employees that have gained weight are left off the list. This is not meant to shame anyone, only to provide a healthy motivation for losing unwanted pounds. Simply challenge participants to journal every item eaten for 1 month. They’ll be amazed at the results this will produce! To support these healthy eating challenges, take a look at your workplace and try to eliminate things that would inhibit the success of individuals. Don’t bring a box of donuts in to promote camaraderie while you’re all avoiding sugar for the month of February! Provide various recipes, tips, and ideas to support each specific challenge. Send employees to our Wellworks For You blog for their own instant access to tips, tricks, and motivation. Challenge participants to develop an attitude of gratefulness. Often overlooked, this one mindset shift can be instrumental in changing the entire course of a life. Each day for a month, challenge employees to write down five things they’re grateful for. Challenge the use of relaxation and stress relief techniques, such as yoga and meditation. Challenge employees to handle conflict using pre-set conflict resolution steps. Each time a conflict is resolved through appropriate avenues, reward those involved with team points towards an end goal. 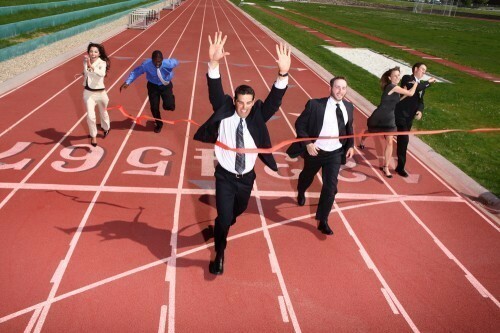 Reward employees that participate in 20 minutes of exercise, 5 days a week. Encourage employees to participate in a couch to 5k challenge. During the summer months, challenge employees to visit all of the city’s outdoor parks (or predetermined area of the city). Provide a map of the parks involved. Splitting employees into teams develops a competitive mindset, but also helps promote an atmosphere of camaraderie and accountability. As you can see, a wellness challenge can take on a variety of shapes. Utilizing social media is a great way to provide instant feedback and constant motivation for participants throughout the process. Start a facebook group, develop a company specific hashtag, promote other company wellness groups by connecting through Twitter and Facebook. When employees can see other companies doing the same thing, it gives greater motivation to increase their own involvement. Find more great wellness challenge ideas here. Or contact Wellworks For You for a customized wellness plan for your company.